Something that many times comes to put anglers in a dilemma is the catch and release “fashion”. The angler stays there with the fish on the lip grip and inside him gives an internal war about where to guide it, back to freedom, or back in the house to enjoy it as a nice meal with his family. He is afraid that if he holds it, other anglers might condemn him about his “killer instincts”. This picture is not very far from the truth and I personally get many “attacks” by people that support C&R. Some very extreme ones also try to reach to the fishing companies that I’m Prostaff, saying that I’m a killer and so on! Off course this is pointless by all means and fanaticism never benefits anyone. But let’s get things from the start. What is fishing? Everybody knows. It is an ancient method of collecting valuable protein food from the sea and rivers. It was created for this purpose. As time passed one branch of fishing evolved, using artificial baits that helped people to catch fish without the need of finding natural bait. This is only the root that brings modern anglers to where we are now. Modern man has not very much differences from his ancestors. The hunting instinct flame still burns to most of us. Some decide to express it with hunting, others with spear fishing, some with fishing while others prefer simply softball and paintball. It is only natural, though I have never seen to any other hunting activities like hunting and spear fishing anyone complain about C&R. Well that would be funny. How you can release a shot in the head deer or a dorado with a spear on its backbone. Sounds extreme ha? Ok let’s see how far is fishing from these examples. Do you know that at least 70% of the releasing fish, die from stress, physical trauma and infections? Some kind of fish are doomed from the time they bite the lure. 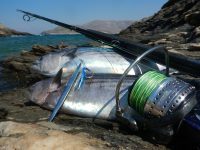 Bonitos and albacores are an excellent example. During fight they struggle so strong that the blood vessels around the gills break and lead to bleeding. How many times have you seen when you are ready to land them, blood come from the gills? Go to 1.27 on this video to see an example. https://www.youtube.com/watch?v=JU2n3_9xVew . 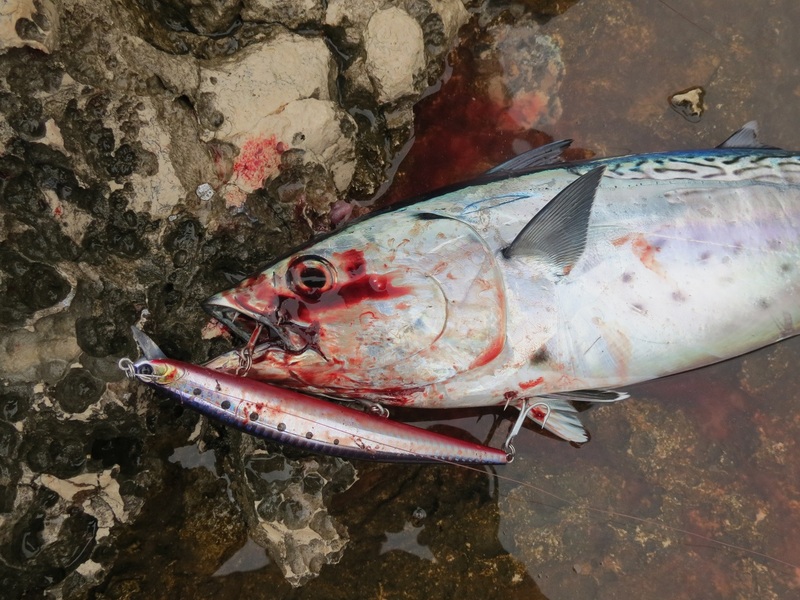 Furthermore bonitos, albacores, dorados, leerfish and many other pelagic species are very fragile to contact. These fish in their natural environment never come to contact with anything, so their skin damages very easily. Damaged skin always leads to fungal infections that weak down the fish and eventually kill it by starvation. This damage can be caused simply by netting it or touching it with bear hands. Not to mention what happens to all fish if we let them touch the dock or the rocks. Another not visible but very often danger is the break of the gall bladder. During fight, the gall bladder breaks and the acid is released on the internal organs leading to severe poisoning. These fish will die 100% on the next hours. Broken gall bladder is the reason why sometimes when we eat the belly of the fish is bitter. Lip grips: Modern studies showed that holding a fish hanged by its mouth, causes always jaw and vertebral problems. Also if the fish struggles hanged, always leads to the puncture to the grip point. Lip grip is only for helping us hold the fish safe and allows us to unhook it easy and take fancy photos. Nets: There is not best way to remove scales from a fish! 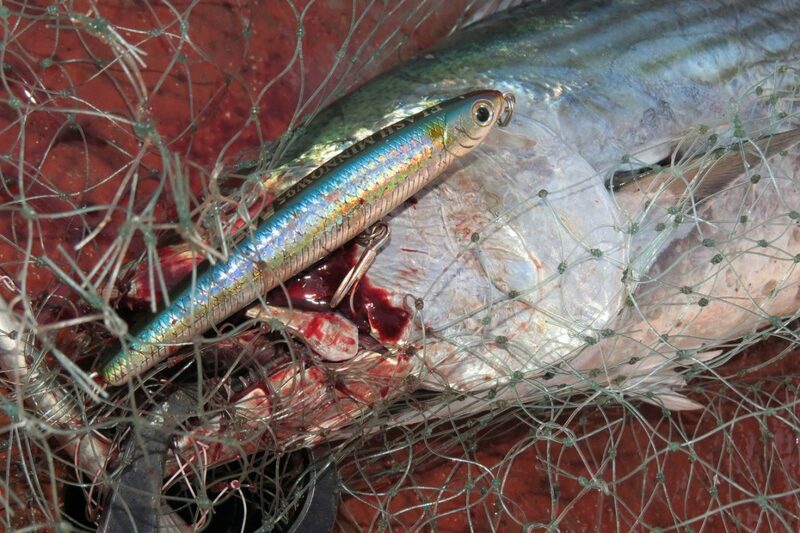 This is why after removing the fish from the net, many scales stay there. 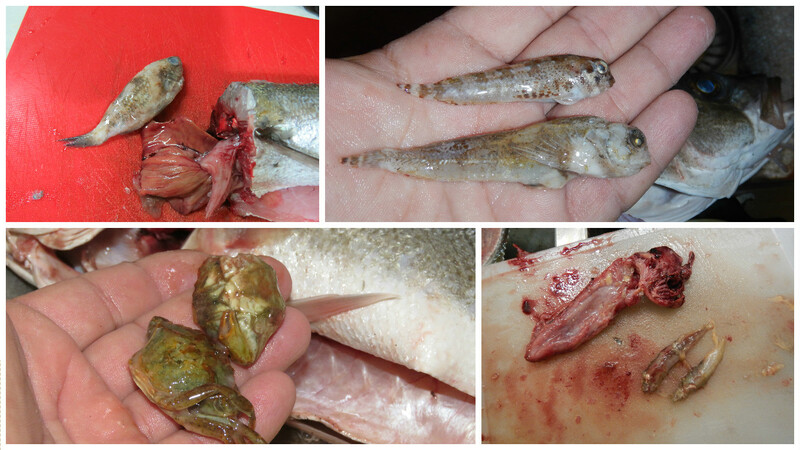 Removing scales and the external mucus of them from a fish always leads to fungal infections. C&R is a very noble way of life in fishing. You agree that you fish ONLY for entertainment, (recreational fishing) and you release ALL the catches. Sometimes I talk with people that say for example, “I got 3 sea bass, I hold 2 and I did to one C&R.” This is definitely not C&R. This is respect! I will analyze that later on this article. How you release them if there are so many risks of killing them accidentally? This is truly a problem. You must have always a wet towel lie next to you on soft ground. You must net the fish with a net with very very small holes, so that the scales won’t be able to stick in there, though that the external mucus cover will be damaged. Then the fish must to external environment and temperature as less as it can be and handled with wet gloves of the same temperature. Actually no time for photos, joy etc. It is worth to say that C&R is much more often way of fishing life in lakes and rivers. Closed ecosystems that are more susceptible to overfishing than sea. In my videos as many of you have seen, in such environments I always release fish! Where is the theater behind C&R and recreational fishing? No matter what anybody says, the fact is always the same. We are having fun and (recreational time) while torturing another creature! NOBODY can deny it! So many times the treble hooks enter major organs, eyes, gills and fins and when it is released handicapped we stay with the confidence that we did the right thing while we sentence the fish to a slow painful death! The following lines are just my personal opinion about this critical topic. I come from a small Greek fishing island. Both of my grandfathers, Markos and Demetres where fishermen. Markos was a professional fisherman that raised his family by the sea. Demetres was a crazy amateur angler! From my 3 years of age I have learned how to bait and recognize signs. From then until today this is all I do. 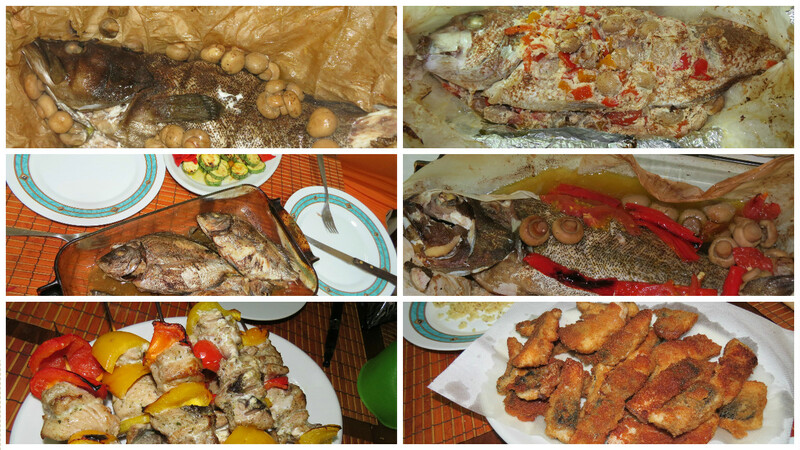 My country’s culture because of the extremely big coastline it has, contains fish as one of the main food items. I eat fish at least 3 times per week. And now my son follows. And so, many thousands of Greeks do. NOBODY can force anyone to C&R. It is something very personal. Nobody can judge anyone about C&R and no one can judge someone about keeping the fish. Nobody knows the economical status of the other in a European union with such economical problem and holding a fish to eat is something very natural. When commercial fishing ships “undress” the bottoms from any type of life form, I prefer to eat a fish I caught, rather than go and buy fish from them. At least I know that the fish my son eats are not sprayed by boric acid to preserve more and look fresh. I have no intention to change my diet for anyone fanatic with C&R. Last but not least strong examples are the fellow Japanese anglers. We all owe a great debt to Japan for providing high quality fishing gear and modern techniques. Nobody can deny that we follow them in most cases. But also we all know that Japan people are crazy fish eaters. Most of them hold all the catch and they celebrate, gathering around a table eating sushi and drinking sake. So many pictures with great catches all around the social media, but never seen a stupid people try to tell them to C&R. I call this guy stupid because he has no job to go and interfere to their culture. The same goes for me, for you and for anyone. There is nothing bad if you want to enjoy eating a fish, and don’t feel shame. This is exactly the same with vegetarians. No one of them can force you to quit eat meat! You should respect them but they must respect you! Yes! Respecting life is understanding that what you do, harms some creatures, but when you can, you can add your help to the environment. A small fish like a small sea bass that doesn’t worth either a photo, is a good idea to be released. It is a very hard creature that has many chances to survive. The same goes to pregnant fish. While some are impossible to save them like bonitos and most pelagic species, grouper fish, snappers, sea bass and more can survive if they are returned as fast and gently possible in their natural environment. Also you can add your help on the good days! There are days that fish bite like crazy. Show respect, keep what you need and release the others. 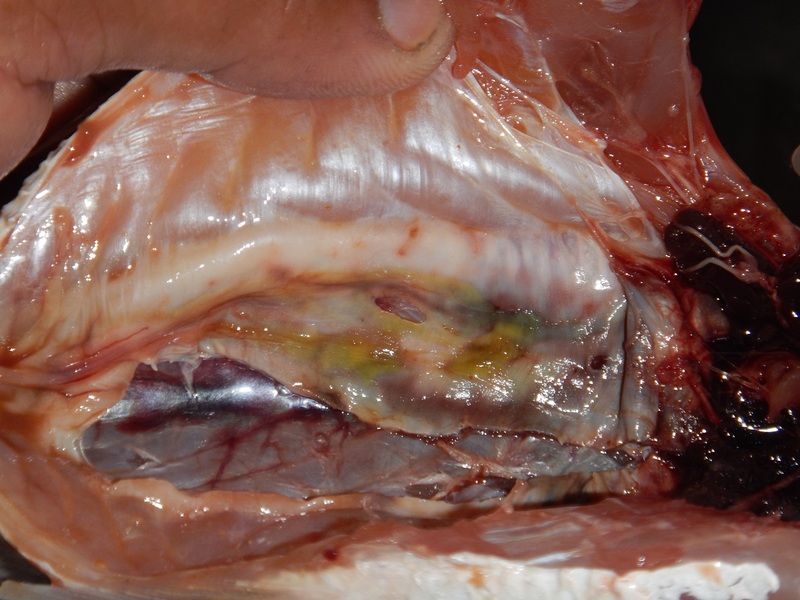 The yellow spot is the digested membrane from the broken gall bladder. The organs that where removed had also visible marks. Why C&R can be impossible to some cases. I still remember some comments about an amberjack on the rocks or at the video with the two swordfish. Some people talk before they think. Says one guy for the swordfish: It is forbidden to catch these fish! You are a bad angler! Burn to hell! Hahahah the last is mine but I’m sure he thought of it. Ok. Lets answer. Swordfish is a pelagic fish that if you take it out of the water, it has minimum chances to survive. So, one option to release it is to cut the FC line and let it with a 100gr jig on the face, hooked with 2 assist hooks. Impossible to hunt, impossible to released from the jig. Not an option. Then comes the problem of how to take it out of the water. I have a guff. If I guff it it will die for sure. If I drag it on the rocks it will suffer severe physical damage. And for sure I had no intention to jump in the sea to unhook it for two reasons. One, it was winter and two, I had no wish my day to end up with a sword up my @ss. 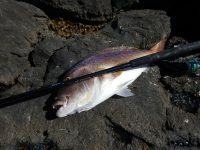 About C&R an amberjack on the rocks without any physical damage is equally impossible and to be honest I would never want to release such a fish. It is delicious in the oven combined with Greek white wine and good friends. 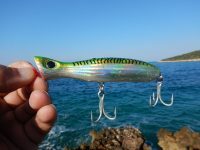 Have you ever wondered why a specific lure that used to work excellent in the past years, now is almost worthless? For sure is impossible to be the same fish in the place so we could justified that they recognize the lure. I believe it is based on the Darvin’s evolution Theory. Every living creature is learning to survive, recognize and avoid new threats. This “knowledge” passes through DNA to the next generations in order to give them the “supplies” to keep the bloodline and protect the species. What I mean is that for sure there will be always fish, maybe not as many, for sure more difficult but don’t forget that we also evolve among them in order to always be able to get some. 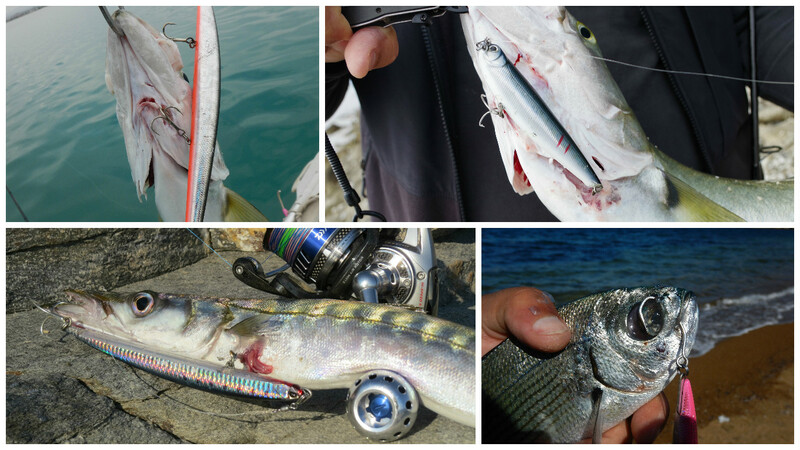 Shore Jigging: A Split Ring Story! I was always fascinated from teeth marks on my lures! Spinning: Treble hooks, Curved and Straight pointed! 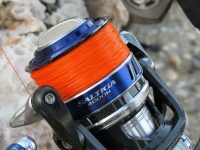 Shore Jigging: PG or HG reels?